So this is it, readers. 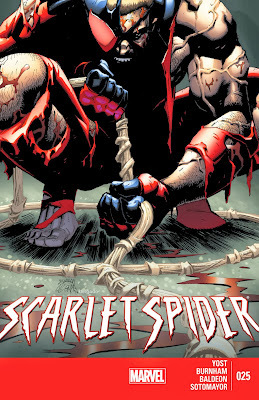 After two years and 26 issues (25 regular issues plus the special “point one” issue), we are down to the very last issue of Scarlet Spider. And given the last issue's literally explosive cliffhanger, the question is not only will issue #25 end with a satisfactory conclusion, but also who would survive. Well, there's no use in crying just yet or delay the inevitable, so we might as well see how our resident spider-clone, Kaine, spends his last days in Houston, Texas, and if his story really has come to an end. After he brutally beats up the dealers, Kaine procures their duffel bags containing millions in cash, and he narrates that he doesn't care what they were selling. Aracely, having read Kaine's thoughts, says it was drugs and that one of the dealers is still conscious. Kaine tells Aracely to stay out of his head and to quit wasting time. Aracely then uses her persuasive powers on the surviving dealer that from now on, he will be afraid of guns, that he'll never pick up a gun again, and that he likes puppies. Kaine again tells Aracely to stop fooling around, and removes his mask. Aracely tells Kaine that her codename is “Hummingbird” and scolds Kaine for removing his mask, asking if he learned anything after what happened in Houston. Kaine reminds her that she was never supposed to talk about Houston, but Aracely tells him that what happened wasn't his fault. Kaine, however, narrates that it was. We then flashback a week earlier to Houston, Texas at the moment Scarlet Spider #24 ended with the Four Seasons Hotel exploding. Kaine and the others are thrown out of the building from the force of the blast, and we see Aracely, Office Wally Layton, Anabelle Adams, and Zoe Walsh falling to the street below, with Kaine seemingly helpless to save them. Then the scene cuts to “Now” where Kaine and Aracely are driving a jeep along a coastal highway in Mexico. More time has passed since the opening scene, as Kaine's now has a full beard again. Aracely, at first, thinks they're going the wrong way, until Kaine points out that she's holding the map upside down. When they stop to stretch, Kaine asks if Aracely is still having dreams. She says they stopped the moment they crossed the border into Mexico. Kaine says that her lack of dreams will make it harder for them to find her parents, and Aracely says that the “coyote” will find her, although Kaine has no idea what she's talking about. Aracely then sees a coyote on the other side of the road, She comments about how it's real and not “scary” like the one in her dreams, when, to her surprise, the coyote says, “Mictlan rises.” Kaine narrates how there is no coyote on the other side of the road, then tells Aracely it's time to set up camp. We then flashback again to Houston and the hotel explosion. Kaine uses his webbing to swing and catch Aracely, then shoots a web to catch Wally. However, Anabelle and Zoe are too far away, and Kaine can see the fear on Anabelle's face, and the faces of the crowd watching helplessly as the rubble from the explosion falls. Kaine, however manages to create several web strands to act as a net to catch the debris while also saving Wally, Anabelle, and Zoe. Then he, with Aracely holding him around his neck, lands on the ground, screaming out in pain. Zoe shouts to Kaine that she did all this because she loves him and will never stop loving him. Anabelle, however, tells Zoe “Stuff it, crazy,” and knocks her out with a punch to the face. Aracely is astonished at what Anabelle just did to Zoe, when Kaine says they have a bigger problem. Floating above them is Shathra the Spider-Wasp, who tells Kaine that she originally following Spider-Man into our world to feed upon him. However, being that Kaine is Spider-Man's “other self,” she says that Kaine will do instead, adding that her children need to feed and need him. Aracely tells Kaine that he needs to go beat up the “evil Anabelle,” but Kaine says they need to get everyone to safety. 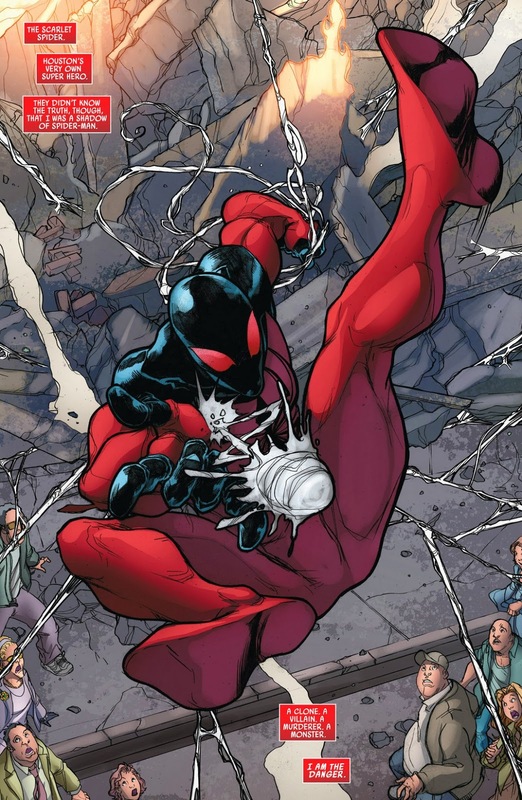 He's also about to say that he's not a superhero, when Kaine's Scarlet Spider costume, having been caught in the explosion and slightly on fire, falls from above. 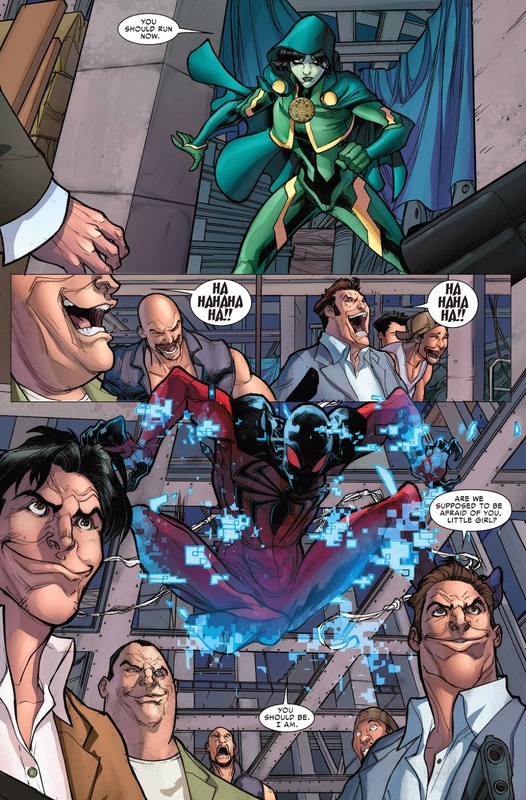 Another flashback to Houston, where Kaine, dressed as the Scarlet Spider, swinging up to engage Shathra. Kaine narrates how the people of Houston see him as their own super-hero, but don't realize the truth—that he was a “shadow of Spider-Man,” that he is “the danger,” and that everyone is in danger because of him—just like what happened to Donald. Kaine tries to land a blow on Shathra, only she's far too fast and is able to land a few devastating punches to him. Kaine feels that there's something about Shathra that makes his “skin crawl” and that makes him want to kill her. He retracts his spider stingers and tries to stab her in the head, only to realize she's not a solid mass—she is made up of countless of black spider-wasps. Shathra declares that Kaine has no idea what he's really dealing with, but will, then commands her “children” to feed upon him. Then the wasps composing her body then swarm over Kaine, tearing through his costume. At that moment, Wally orders Shathra to get away from Kaine and several bullets harmlessly pass through her body. Shathra turns to face him, saying that while he's not worthy to feed upon, he will be fun to kill. Kaine, still attacked by the wasps, thinks that he will not let what happened to Donald happen again and then starts to transform into his “Other” form. When Shathra is dead, the Other changes back into Kaine, and Kaine sees Anabelle and calls out for her. Anabelle stares at him, frightened, then runs away, with Kaine calling out for her. Wally then tells Kaine that he should just go, that while he'll cover for the police, Kaine needs to leave. Aracely protests, saying that Kaine saved the city again, but Kaine tells her to stop. Aracely asks why, not understanding why what he did was bad. Kaine tells her “Because I'm not a hero,” then walks away. Not that this issue is bad necessarily. 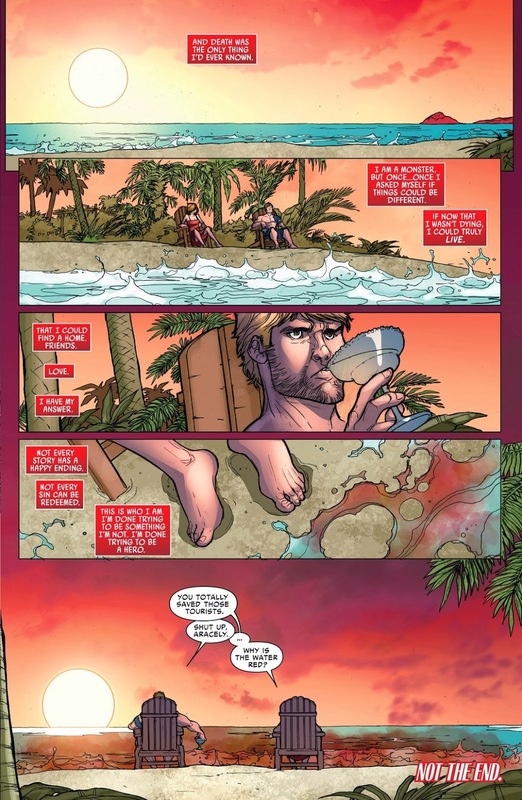 I liked the narrative structure Yost employed here, in that his shifting between the events directly happening after Scarlet Spider #24 with the present day made you wonder what it was that happened that forced Kaine and Aracely to leave, much less if anyone actually died. 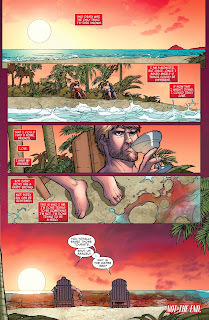 As usual, I loved the interaction between Kaine and Aracely; their interaction and the way they play off of each other (and nice touch to have Aracely being able to “read” Kaine's own narration) has always been the best aspect of the series, and its a good call by Yost to have Aracely go off with Kaine and thus carry their partnership over to the upcoming New Warriors comic. 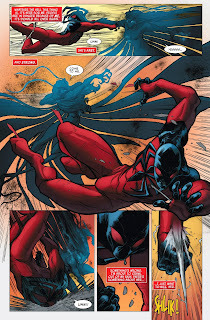 Also, David Baldeon's art is, again, well done, and I'm sure I'm not the only one who notices that it bears a passing similarity to the work Ryan Stegman did when he was the artist at the beginning of the series (although, he was apparently confused about the differencs between the female characters, given how at one point Kaine's narration said he was too far away from Anabelle and Aracely even though Aracely with with Kaine and it was Zoe who was falling; or with how he occassionally drew Aracely wearing Anabelle's clothes). All that being said, I feel a bit disappointed, not because the series is over but for how it ended. True, just as I mentioned last time, Yost manages to weave the subplots involving Zoe and Shathra together quite well, but it's also clear that they were meant to be separate stories given how quickly they're dealt with and resolved. Plus there's still some lingering story threads that have yet to be addressed. Is Donald going to wake up from his coma? Will we ever see Wally or Anabelle again? Who or what was Clutch that, according toWally, got everybody in Houston so spooked “two years ago?” What about Esmeralda Lobo, Mr. Montezuma, and his super-powered posse from the “In the Company of Wolves” story arc (Scarlet Spider #13, 14, and 15)? What's with the blood in the water? Are those from the bodies of the muggers or is it another sign that "Mictlan rises?" And of course, what is the meaning behind Aracely's apocalyptic visions, and where are her parents, and is she really the reincarnation of the Aztec God Huitzilopochtli? I'm sure some of these question are going to be dealt with in New Warriors, but it's just too bad that Yost didn't have the time answer them in this series before its cancellation. Also, while I think I understand what Yost was going for in essentially having Kaine's journey come full circle and that it wasn't a particularly happy ending, it also puts Kaine's development right back at square one. He essentially has Kaine all but say that he completely wasted his time in Houston and didn't learn anything other than what he's already said over and over ad nauseam throughout the run--that he's “not a hero, but a monster,” or so he believes. Sure, he now has Aracely for a sidekick so he's not the complete brooding loner that he once was, but the fact that, after all this time, Kaine still has the same “I'm a badass crying on the inside” attitude just comes off as really, really annoying. Still, I can't fault Yost too much. 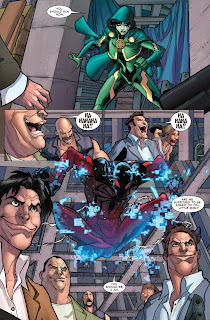 Basing a series around a character from the infamous Clone Saga took some guts, and it paid off. Yes, the series has its occasional drawbacks and missteps, but overall it was quite good, and reading Yost's acknowledgment letter in the back, it clear he has a fondness for Kaine, Aracely, and the rest of the Scarlet Spider's supporting cast. As he says, it's not as if this will be the last will ever see of Kaine or his story, even though it will be in another comic, so, as the last page of said, this is “not the end.” Overall, I enjoyed this series and it's subversion of Spider-Man tropes via his “evil” clone, as I'm sure my fellow Spider-Man and Scarlet Spider fans have enjoyed following along, as well as reading my and Jesse's reviews. Here's looking forward to seeing what adventures lie in store for Kaine and Aracely in the New Warriors.